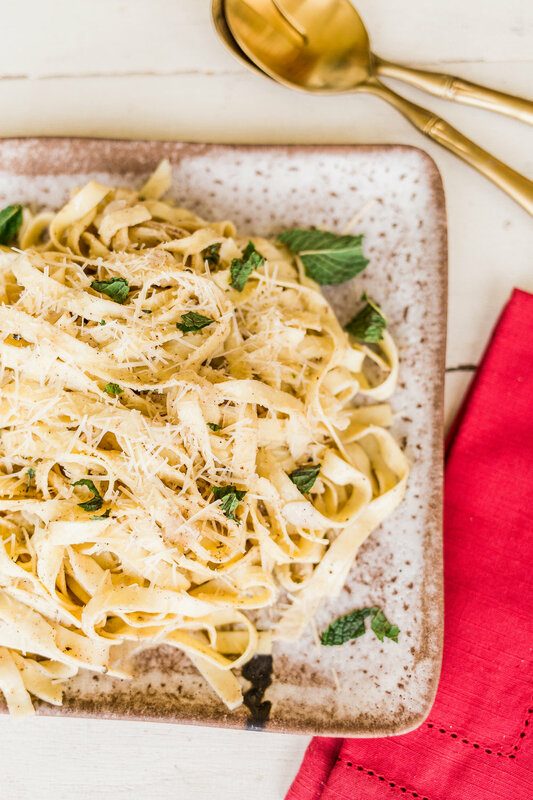 If you've seen the movie The Holiday, you know the story behind this recipe. If not, you should see it, but I'll tell you anyway. In the Christmas Eve scene, Kate Winslet's character insists her and Jack Black have "Christmas Fettuccine" to cheer them up. 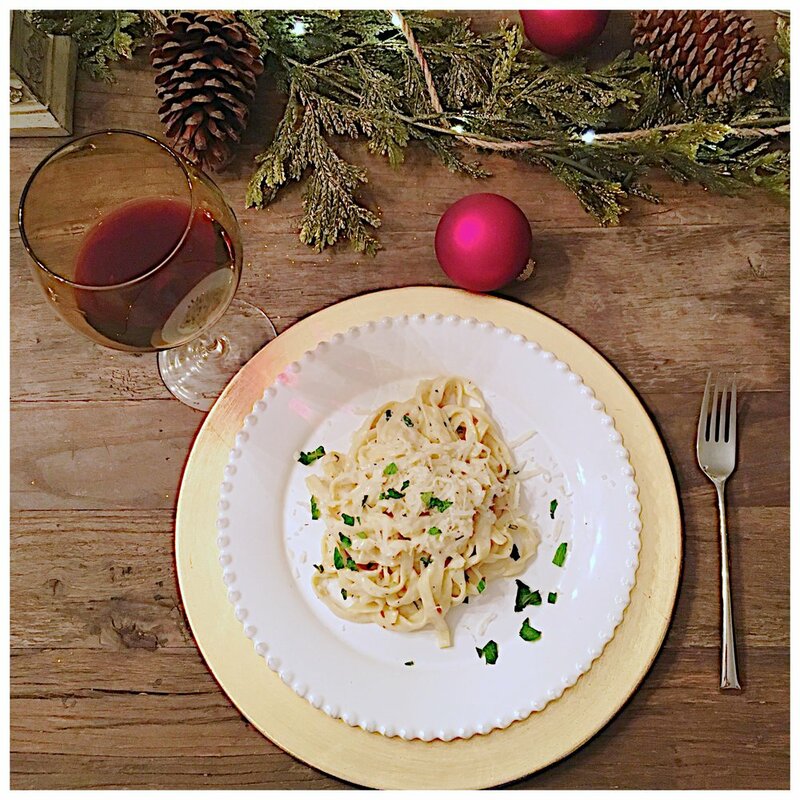 I have no idea if "Christmas Fettuccine" was ever a thing before that movie, but it certainly is now! I have a deep love for that movie (easily top 3 holiday movies ever), and I have a great love for pasta, so I just had to recreate the dish. 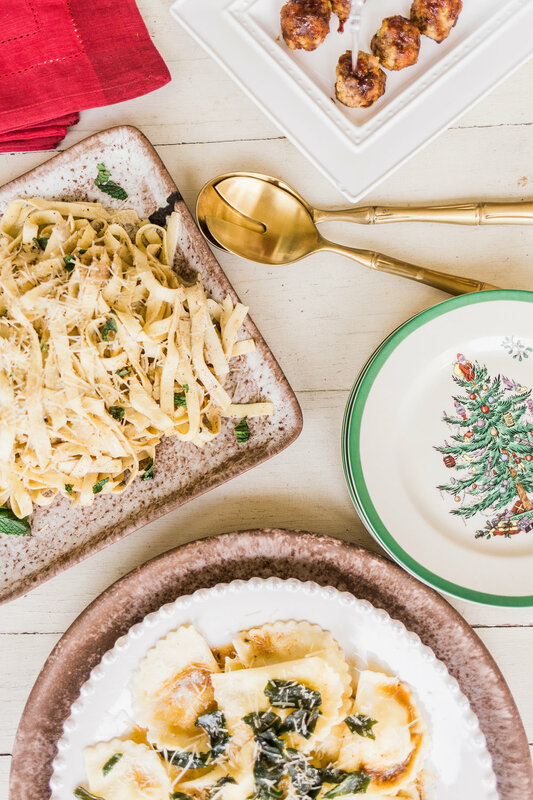 You don't have to homemake the pasta, but it's Christmas and everything has to be extra special so I think you should! 1. Make the pasta. Dump the all-purpose flour and semolina flour on a clean work surface in a mound. Make a hole in the center with your hand. Crack the whole eggs and egg yolks into the center and add the olive oil and salt. Beat the eggs, olive oil, and salt together with a fork until smooth. Using the fork, slowly start adding flour to the wet mixture. The dough will start to get dry, add a few tablespoons of water to help it come together then begin kneading. Knead for 5 to 8 minutes or until dough becomes smooth. Wrap in plastic and refrigerate for at least 30 minutes. 2. When ready to roll out, cut dough into quarters. You can use a rolling pin if you don't have a pasta machine - roll the dough out as thin as you can, in a rectangular shape then use a sharp knife to cut noodles into strips. Flour a sheet pan and place noodles on the pan until ready to boil. 3. Make the sauce. Melt the butter and heavy cream together in a saute pan over medium low heat. Add the garlic, nutmeg, and salt and pepper to taste. Let cook for at least one minute then keep warm over low heat. 4. Boil the pasta for 2 minutes then immediately transfer to the heated sauce. Don't be afraid to add a little pasta water in with the sauce (at least 1/4 cup). Add the mint and toss everything together. Serve with a sprinkle more of chopped mint. CHEERS TO A HAPPY CHRISTMAS!